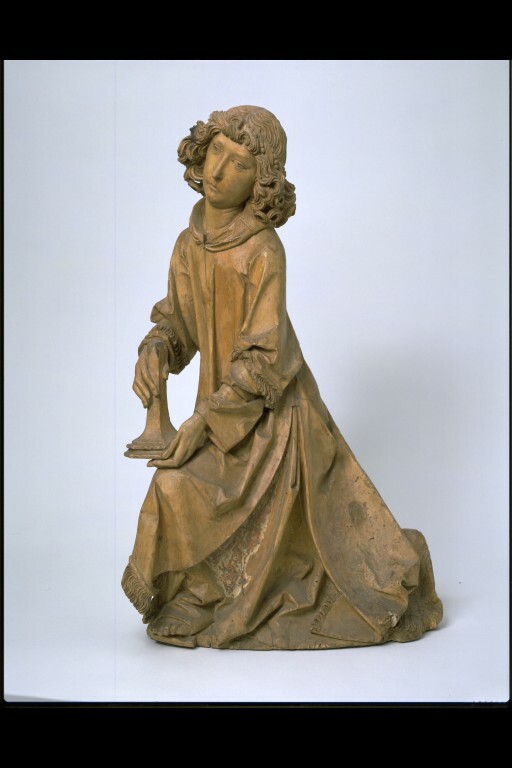 This figure of a kneeling angel is one of a pair. They were designed to flank the tabernacles that held the Holy Sacrament in a Christian church. 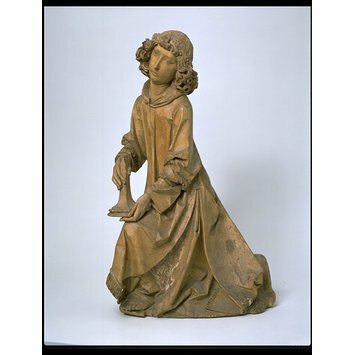 This pair are similar to other pairs of kneeling angels by the German sculptor Tilman Riemenschneider (died 1531). The pairs in Rotheburg and Würzburg are larger and more elaborate. The V&A pair are more like a pair in Eisenach. This suggests that two standardised types were produced. Weber 1888, pp. 54-5. Oechelhäuser 1898, pp. 179. Tönnies 1900, pp. 272-73. Weber 1911, p. 232. Review 1912, p. 4, pl. 2. Schrade 1927, II, p. 32. Bier 1930, p. 38, note 1. Freeden 1952, p. 38 fig. 92. Baxandall 1974, p. 46, no. 9. Freeden 1976, pl. 37. Bier 1982, p.123. Kalden 1990, p.111, note 411. Penny 1993, p.130, fig. 120. Exh. Baltimore/London 1997/2000, p.193, no. 65. Jopek, Nobert. 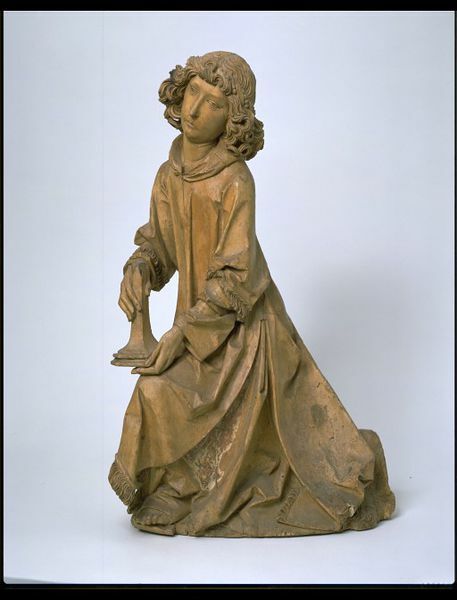 German Sculpture 1430-1540: a Catalogue of the Collection in the Victoria and Albert Museum. London: V&A Publications, 2002. cat. no. 18. pp. 56-58. Probably from the parish church in Külsheim in Baden.